Vlore passenger and car ferry ticket prices, timetables, ticket reservations and information for ferries sailing from Vlore to Brindisi. Compare all available Vlore ferry ticket prices in real time and book the cheapest available Vlore car and passenger ferry tickets sailing to and from Vlore, Brindisi with Agoudimos Ferry Lines and Red Star Ferries ferries online with instant confirmation. Book Vlore Ferry Tickets with Agoudimos Ferry Lines and Red Star Ferries for ferries sailing from Vlore to Brindisi online in advance to enjoy the cheapest available ferry ticket price. The price you see is the price you pay. There are no hidden extras or surprises such as added fuel surcharges or booking fees and we do not charge you anything extra for paying with a Visa Electron card. The price we quote you for your selected Vlore passenger or car ferry ticket, onboard accommodation and vehicle type is all you will pay, and that's a promise. To obtain a Vlore ferry ticket price and book your ferry ticket securely online please use the real time ferry booking form on the left. You are also able to add a hotel at your destination, or anywhere else, to your ferry ticket when completing your ferry ticket reservation. The modern name for Vlorë is the Albanian form Vlorë or Vlora while in the Gheg Albanian dialect it is known as Vlonë. Vlorë was created in antiquity as a Greek colony in the territory of Illyria. Its first name, still used today in Greece, is Aulón (Greek: Αυλών), which means valley and may have been a reinterpretation of a pre-Greek name. In early 20th century, Vlorë was referred to in English as Avlona or by the Italian name Valona. The city of Vlorë remains a major seaport and commercial centre, with a significant fishing and industrial sector. The county produces petroleum, natural gas, bitumen and salt. Tourism has become a major industry in recent years, with many hotels, recreational centers, and vast beaches. Vlore is Albania's second largest port, at the meeting point of the Aegean Sea and the Adriatic Sea. It is also a fishing port and holiday resort. The city center is much like most Albanian towns in that there is nothing much to see, but concrete towerblocks - and a lot of palm trees. It is however the starting point of the coastal road to Saranda, along the 'Albanian Riviera'. This road goes from brand new to shaky along mountain passes, hairpin bends down to deserted beaches, miles and miles through olive groves, from Greek styled village to village. It is feasible to hitch hike all the way to Saranda in one day, but it is worth more time than that. Vlore is proclaimed a hero city. It is an old city, where important events in the struggles for freedom and independence have taken place. In ancient times the city was known under the name of Aulon. At the beginning it was only a port. Aulon was famous for its olive groves and vineyards. After the fall of Apollonia and Orichum, it became the principal port of Illyria. In the fifth century Aulon was the centre of diocese. The emigrations of barbarians damaged it badly and brought the withdrawal of the city deeper in land. There is a regular ferry connection from Brindisi in Italy by sea. Several companies operate this service, but the ships depart usually at the same time. A very convenient possibility is travel by night, departure from Brindisi 23:00 and arrival to Vlore at 7:30. The ferry service to Vlores runs daily, in off-season period except for Sundays. You should visit the nearby village and the old castle of Kaniné. The view over Vlora and the Ionian see is great. The Mosque of Muradie, was built in 1542, is believed to have been designed by the architect Sinani, on the orders of Sultan Sulejman, when he was in Vlora preparing his naval expedition against Italy. With the closing down of the mosques and churches in 1967, it has been used as the museum of architecture of the district. In the town centre is the bronze monument of independence, unveiled in 1972. On a high irregular pillar of rock stands a figure of a standard bearer, while below are depicted distinguished figures of the movement of Albania's independence. It is a joint work of the sculptors, Kristaq Rama, Shaban Haderi and Muntaz Dhrami. In honour of the day of independence, the main square in Vlora is called - The Square of the Flag (Sheshi i Flamurit). The Museum of Independence reflects the stern struggle of the Albanian's for freedom and independence, the events that brought about the raising of the flag on the 28th November l912, when Albania was proclaimed an independent state. Vlora has a cement factory and is also the producer of plastics. The region of Vlora is rich in agricultural products, especially in fruits, olives and grapes, and in dairy products. There is also a cannery whose products are used for export. Vlora is the seat of the Ismail Qemali University, founded in 1994, which replaced the school for Naval Officers. Students can study business administration, nursery, naval engineering and English language. Best Price Guarantee - We always offer you our lowest available Agoudimos Ferry Lines and Red Star Ferries passenger and car ferries ticket price to and from Vlore. There are no hidden extras or surprises such as added fuel surcharges or booking fees and we also we do not charge you anything extra for paying with a Visa Electron card. The price we quote for your selected Vlore ferry ticket, onboard accommodation and vehicle type is all you will pay, and that's a promise! In the unlikely event you find the same all inclusive Vlore ferry ticket cheaper in the brochure of any other tour operator we promise that we will do our best to beat that price or offer you the choice of requesting a refund. 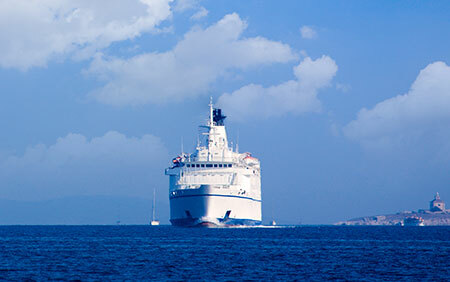 To book Vlore car and passenger ferry tickets please click here. At ferryto.co.uk you are able to obtain live Vlore ferry ticket prices, check availability and book car and passenger ferry tickets to and from Vlore at our lowest available ticket price. Ferryto.co.uk is part of the world's largest online ferry ticket distribution network providing the ability to book over 80 major European ferry operators including to Vlore and to over 1,200 other ferry routes throughout the UK, France, Spain, Ireland, Holland, Eastern Europe, the Mediterranean, the Baltic and North Africa.